There is nothing more soothing and delightful than an afternoon spent designing or drawing with the best markers for coloring. There is a reason why the adult coloring market is so hot right now, and it never went out of fashion for kids! To help you find the best coloring markers, we researched a variety of new and best selling products. The result is the top ten marker reviews below. Before we get started, here’s what you need to know when shopping. Case: A marker set is vibrant and fun, but it can also be a lot of little pieces scattered around. They become hard to consolidate and organize. Many of our top ten marker set choices include a case – a real bonus! Pieces: The number of pieces listed for each of our top ten items can also translate to the number of markers. Sometimes, there are also additional extras. But for the most part, we’re featuring 80-piece sets, 60-piece sets, etc. Line Width: Line width ranges from thick to fine, and everything in between. Marker sets sometimes include multiple widths, which can be a real boon to artists. Check this category to see which line widths are included. You’ll be prepped for purchase! Brush Tip: The best brush markers come in many different shapes and sizes. There are marker aficionados, however, who are looking specifically for a brush-tipped set. These markers mimic the movements and designs of brushes. Check for this style if that’s your preference. Washable: A set of washable markers is particularly useful if you are buying the set for a kid, or kids. We’ve all heard horror stories of marker stains going onto tables and walls. With washable markers, cleanup is a breeze. Permanent: Artists and amateurs are both looking for fine permanent markers for their work. Whether you are detailing an adult coloring book or sketching your new fashion line, these are the best of the best. We have many lovely permanent options! Now that you know how to choose a great set of markers for drawing and painting, let’s get right to the reviews. Here’s the deal: If you’re in a hurry, take a look at the top pick and the budget pick. Both are fine products and are among the best on our list. Right below, you’ll find the runner-ups in our marker reviews. If you’re looking for the best marker sets, they are on this list. Let’s get started! The best markers on the market include the Ohuhu Dual Tips Marker Pens. They have been imitated but never duplicated. We love the 80-piece marker set. It includes 80 different hues, each clearly marked with both their names and color-coded caps. You don't need to go hunting for the shade required for the next portion of your project. It gets better: The Ohuhu Marker Pens have two sides. 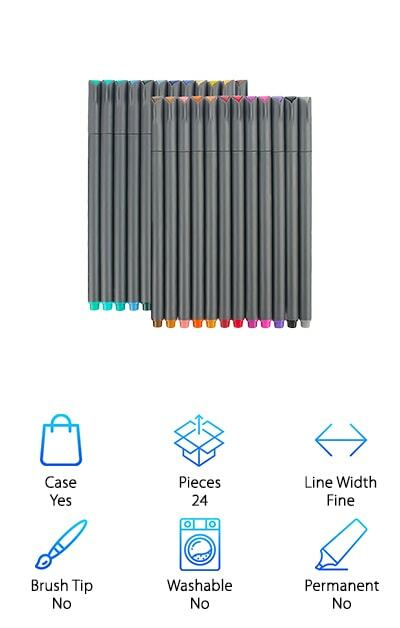 On one end, you get a broad tip with up to 6 millimeters of wide drawing power. Since many of these markers can be used as highlighters, this is a big asset. On the other side, you’ve got fine lines for underlining and creating detail. Colors include tender pink, pastel violet, and pale green. Every shade of the rainbow is here, and they all fit into a handy and stylish black carrying case. The Ohuhu Markers are alcohol-based, do not bleed easily, and can be blended. You’re going to love creating art! Don’t be fooled into thinking that just because this selection is identified as our budget pick, that it is also cheap in quality. Far from it, my friend. The RoseArt SuperTip Markers are some of coloring's best-kept secrets. Now: We're talking an assortment of 100 markers, with no colors repeated. Multiple hues of blue, green, purple, red, and much more are included in this set. These are long-lasting, bright colors made from non-toxic ingredients. They are also washable. If little Billy decides to create his art of the day on the kitchen wall, some water and a good sponge should take it right off. The packaging doubles very cleverly as a case. The front pops up and folds back to reveal an easy-access multi-tier display. They call it the pull ‘n pop! 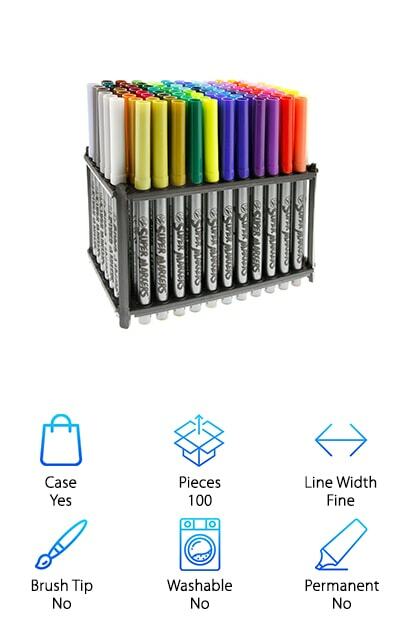 Each marker is topped with a matching lid so you don’t need to search for a particular hue. What a savings! Enjoy creating some beautiful work. Our marker buying guide features a lot of great marker sets. For value for your dollar, there are few sets as great as the US Art Supply Markers Set. Just take a look at the character of this 100-marker set. The vibrancy and bold shades are yours with their special bullet tips. Pointed at the end, and bulbous at the base, they can be rotated or angled to create a fine or medium-width point. You can use them for adult coloring books or for scrapbooking. 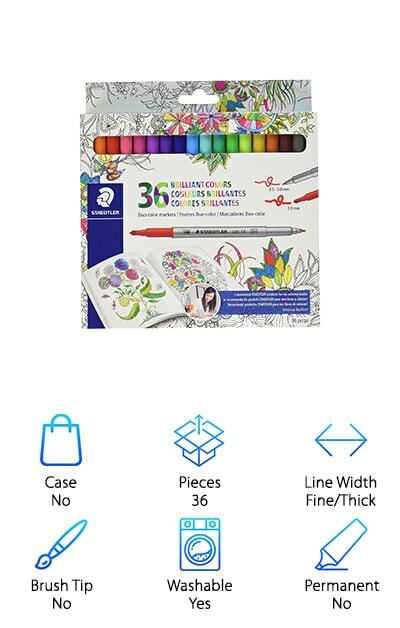 If your kids are the ones who need a creative outlet, this is also a perfect choice for little hands! The markers are water-based. They are also acid-free, and non-toxic. For organizing, use the included rack with a spot for every single color. They will make a delightful display at your desk. They are also an awesome gift for someone you care about, any time of year. Channel your inner artist with US Art Supply! It is always nice to find a set of markers that you can use to fill in the lines without seeing bleeding. The Crayola Fine Line Markers get the job done beautifully. With 40 different colors to choose from, the variety is very appealing. Here are some of the shades included in this box: Royal purple, sea foam green, terra cotta, sandy tan, and coral reef. Take this Crayola set out to a shady spot with a fine coloring book, and spend an afternoon relaxing and taking your mind off of life’s more serious responsibilities. Each of the 40 markers sports a fine tip for delicate detailing. There are all kinds of coloring books out there: From fantasy to floral, each of us can find something that suits our nature. Now, there is an adult coloring set that will allow you to explore with your own imagination. 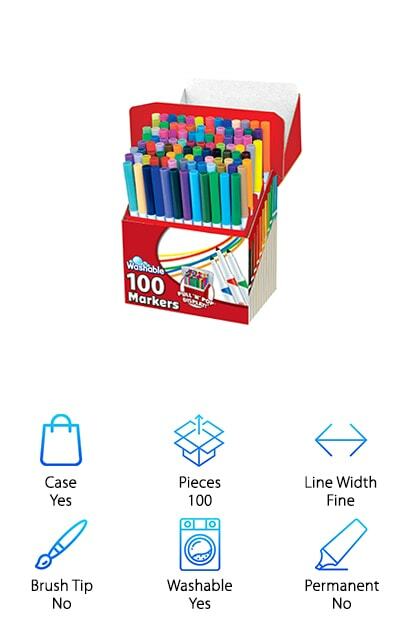 Try the Crayola Fine Line Markers today, and discover art at your fingertips. The joy of adult coloring books comes from the details. Intricate loops, patterns, and scenes can remove you from the distractions of your everyday life. They do require, however, a set of markers with a very fine point. That’s why some of the best markers for adult coloring are the Taotree Color Pens. These pens are saturated with rich hues. There are 24 markers in all. They arrive lined up in a vinyl bag, so transportation is very easy. 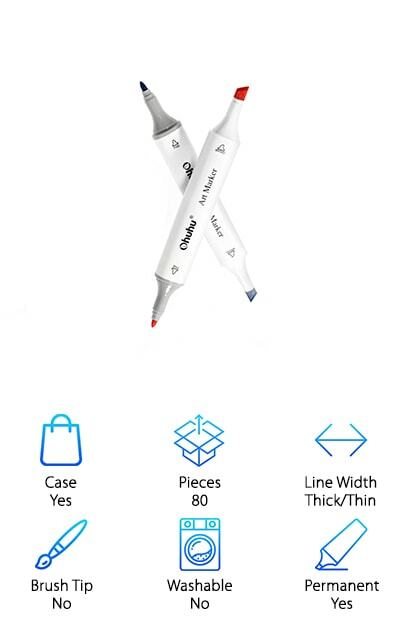 It has a snap closure so the pens don’t go flying everywhere inside your bag. You can go color at the library, or your favorite coffee shop. Manga, graphics, illustration, or design all become approachable tasks with the Taotree set in hand. And remember the fine point we mentioned? That is a .38-millimeter tip. Even the tiniest accents are within reach. The folks at Taotree are so sure of their product, they provide a 100% money-back guarantee. Let’s go start drawing! The Qianshan Dual Brush Pen Markers have a lot going for them. First of all, they are a flattering mix of neon and earthy tones, and every hue in between. That is pretty unusual for a set of 24 markers at an economical price! They also have those highly sought-after brush tips, which mimic the movements and patterns of a paintbrush. With this set of markers, you can create imagery that looks far more complicated! The Qianshan Markers arrive in a handy vinyl case with a flap that fastens shut. 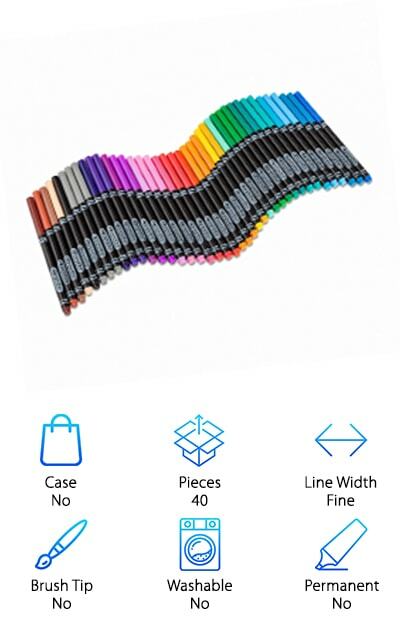 Each marker is double-ended. On one side, you get a fine tip for handiwork requiring a light touch. On the other, there is the brush tip. It is wonderful for shading and coloring. 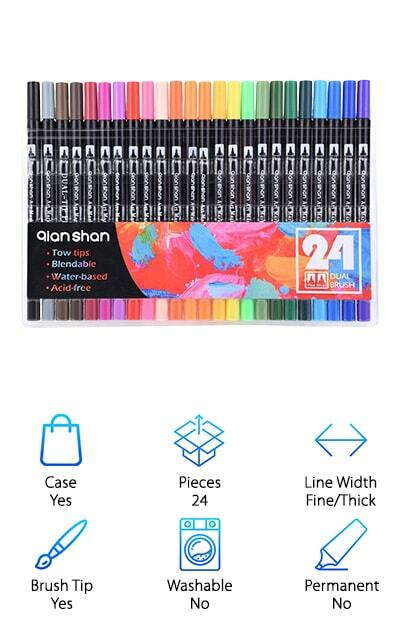 Qianshan offers a money-back guarantee on this marker set because they know you are going to love it. It is safe for you and for your kids, created with non-toxic and acid-free ingredients. You'll love the colors! 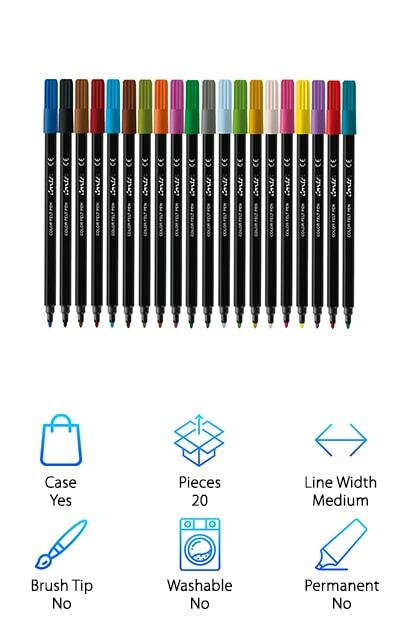 Your palette is virtually unlimited with the Shuttle Art Dual Tip Art Markers. That’s why our reviewers think they are some of the best markers for coloring books. The truth is, they are great for just about anything! They are designed to resist fading over time. They can be used on ceramics, wood, paper, cloth, and even glass. These are permanent markers, so they are ideal for real art projects created by both professionals and amateurs alike. The Shuttle Art set is generously stocked with 50 different colors. Every pen is dual-sided, with a 7-millimeter broad tip on one side and a 1-millimeter pointed bullet tip on the other. Use the broad end to shade and blend hues. The fine point can write elegantly and mark shadows and highlights. The inks used in these pens are water resistant, and they are built to last. They are non-toxic and acid-free. Shuttle Art guarantees a 100% money-back guarantee, so draw away! People expect a lot from a marker labeled with the Staedtler name. That’s why our reviewers wanted to include them on our top ten list of the best coloring markers for adults. Here are the details: These truly are finely-made markers that will stand the test of time. They are double-sided, giving you flexibility in the look and feel of the art you want to make. Both sides are constructed from strong fibers, so you’re not going to get markers that mush after a week or two. One end has a very fine, .5-millimeter tip. This can be used for the more minute and delicate parts of any artwork. On the other side, there is a 3-millimeter line width tip for shading and filling spaces in. Altogether, this set is comprehensive and gets the job done. Your creations will pop off of the page with these 36 colors. If the kids want to try them, they are also washable! An afternoon spent with a fine set of markers, a coloring book, and a cup of tea. That’s our idea of a calm and relaxing way to unwind. The Conte brand dates all the way back to the 19th century. In addition to markers, they are known for their fine pencils and pens. The BIC Color Collection by Conte continues that grand tradition of excellence. 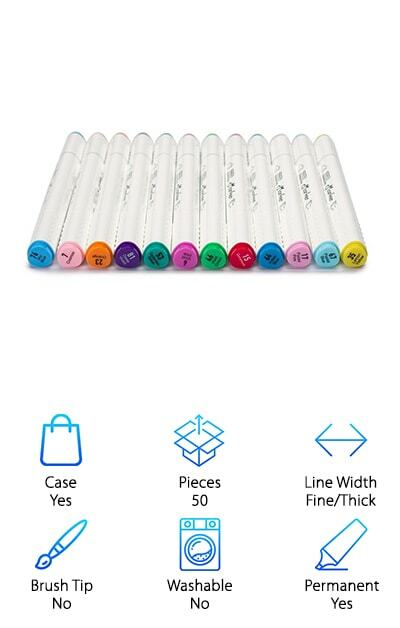 This is a set of 20 markers, with beautiful variation and vibrant color. The tips are felt, measuring .7 millimeters in width. That falls right in between the typical fine or thick tip. In other words, you will be able to use one marker tip to create looks that normally require two or more thicknesses. That leaves a lot of flexibility for your art! The 20 markers come housed in a lovely black storage tin. Take it with you on travels! Each one has a colored lid, leaving no doubts as to the shade inside. 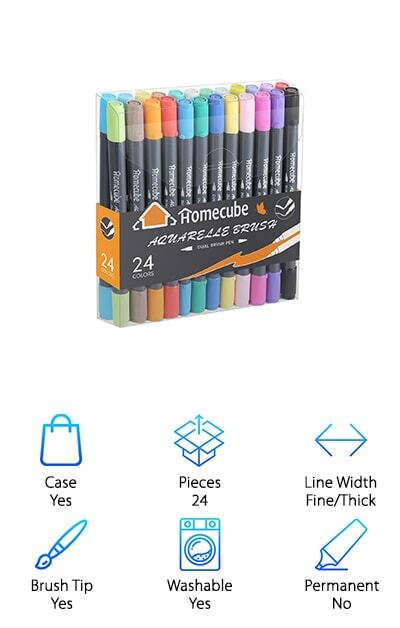 Welcome fine art into your home with the Homecube Brush Pen Art Markers. If you've been stumped lately, trying to come up with a great gift for a child or an adult, stop right there. People of all ages love to draw! They will be wowed by the sophistication of this 24-pen set. Every marker is housed in a clear and highly accessible case. On each end, they are topped by lids clearly designating the shade within. On one side, you have a thick and flexible 2-millimeter brush tip. On the other side, there is a firm fine tip measuring .8 inches. These markers are non-toxic and odorless. They are also acid-free. They inspire vivid crafts with colors that dry quickly and do not bleed. Cleanup is also not an intimidating task. Because these markers are water-based, they wipe off easily from most textiles. Homecube stands by their product with offers of a full refund or replacement.